SOUTHWEST & SOUTH CENTRAL COLORADO—While crews have cleared snow from mountain corridor highways a handful of times this season, those working at lower elevations are prepared to use new snowplow equipment during future storms. In 2017, Southwest and South Central CDOT crews added to their arsenal the "tow plow," a trailer equipped with a plow blade, which will be pulled by a snowplow truck. The driver can swing the tow plow out to the right of the road to cover more area of the road. The tow plow is also equipped with a tank, which carries and distributes sand or liquid de-icer that's used as needed. These plows are used on US Highways 160, 550, 285 and 50 near Durango, Monte Vista, Alamosa, Blanca, Fort Garland, La Veta Pass, Poncha Springs and Salida during winter. "Our operators were trained and anxious to use the tow plows last winter," said CDOT Durango-based Maintenance Supervisor Billy McDermott. "However, last year's lack of heavy snows limited the use of this new equipment. We're ready for more snow this year and will be able to do more with less. It will be a great advantage to clear more miles in less time." The blade of a regular snowplow is 10 feet long and can clear 10 feet worth of snow across the road. The new tow plows can clear 12 feet more. With the extra 26-foot blades extended at an angle, the tow plows will clear 22 feet of snow across the road. The overall length of truck and tow plow moving straightforward down the road is 70 feet long. Tow plows will typically be followed by an additional snowplow and a CDOT supervisor's vehicle. 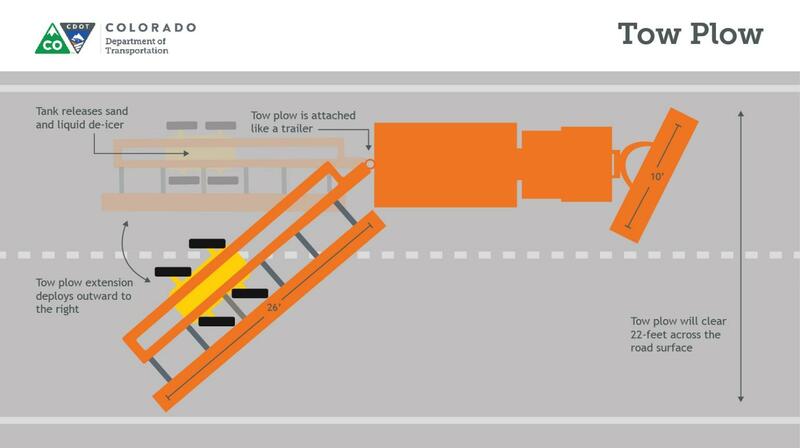 However, if a motorist happens to follow directly behind a new tow plow, CDOT warns the public not to be surprised if and when the pulled trailer deploys to the right. "It may look like the snowplow is jackknifing," explained Ronnie Medina, CDOT Alamosa maintenance supervisor. "But the snowplow driver is actually swinging out the towed trailer, lowering the attached plow. This will help us gain a lot of surface area and push as much snow as possible off the highway. Like normal snowplows, the new tow plows will be equipped with flashing warning lights and will travel at about 30 mph to 35 mph. Motorists should never pass a tow plow and should allow plenty of room for the plows to maneuver. 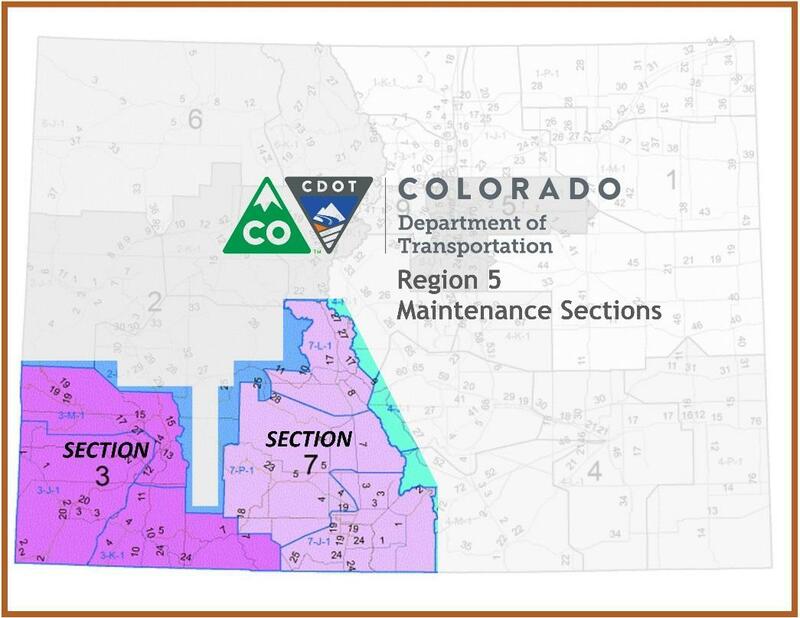 CDOT Region 5 is made up of two maintenance sections. In addition to the new tow plows, the region's maintenance crews handle more than 200 pieces of heavy equipment in 15 counties during winter. "When winter storms are forecast, our maintenance patrols are on standby for shifts 'round-the-clock," said Medina. "Once a storm actually hits, crew members are on 12-hour rotating shifts—until dry road conditions are reached. At least half the crew members on each patrol are out at any given time, some overlapping their shifts to keep coverage consistent."